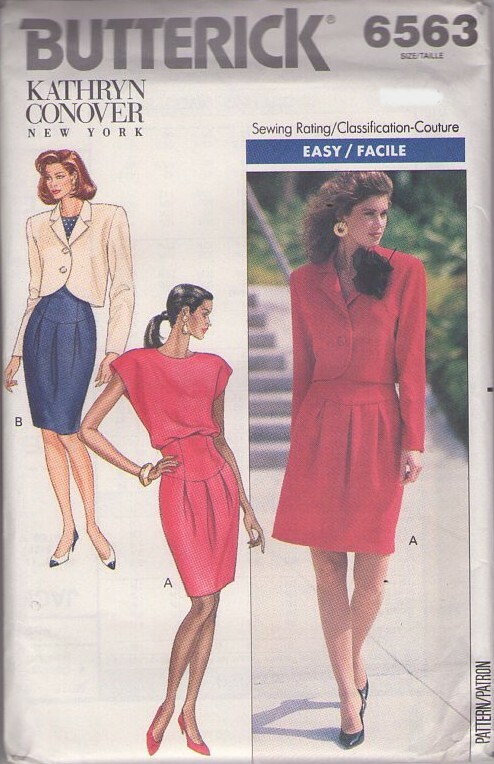 1988, 80s Designer, Retro Career Separates Clothing Patterns - MISSES' JACKET, SKIRT & TOP Loose-fitting,,, unlined, waist length jacket has notched collar, slightly extended shoulders, shoulder pads and long sleeves. Tapered skirt, above mid-knee or mid-knee, has fitted yokes with raised waist, front pleats and back zipper and hemline vent. Very loose-fitting, pullover top has back neck slit with button op and cap sleeves. Narrow hem.